Clays and silts include sediments settled from suspension, whatever the depositional environment. Such sediments tend to be thin bedded and produce closely spaced reflections (relative to other reflection spacings for a particular seismic section). If the depositional area is extensive, the reflections generally show moderate to good continuity. Amplitudes tend to be moderate to poor, but is very dependent on bed spacing (interference effects) and lithology. Divergent reflection patterns are diagnostic of fine-grained sediments , as they indicate deposition under conditions where subsidence and sedimentation rates are of similiar magnitude. Not uncommonly, acoustic impedance contrasts are so low that the interval appears reflection free. Alternatively, destructive interference by beds of a thickness 1/30 wavelenght or less, can also produce reflection free intervals. 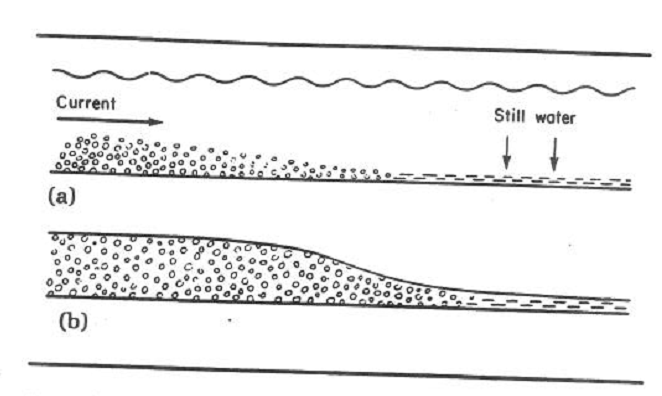 Chaotic reflection patterns can result from deep-sea current activity or slumping, and from flowage due to loading, elevated pore pressure, or slope instability. Reflection configuration is the shape of a reflection or surface. Some depositional environments produce characteristic reflection configurations. For example, a prograding delta produces a characteristics reflection package consisting of subparallel topset reflections, inclined foreset or clinoforms, and subparallel bottomset reflections in the basinal area. Lithology can be inferred from the location and the individual reflection attributes. For example, sigmoidal prograding configurations are more likely to be shale prone than are oblique prograding configurations; slumps tend to occur in shale-prone and so on. Reference : Practical Seismic Interpretation, Michael E. Badley. In basinal clay or shale sequences, deposition is predominantly from suspension load. Conditions of slow but variable, and not necessarily continous, sediment accumulation typify such sequences. Often deposition of clay-sized grains is interrupted by "rare event" deposits (turbidite flows induced by storms, earthquakes, etc) . Bed thickness in this type of sequence generally ranges from a few millimeters to a few tens of centimeters with the exceptional bed being more than a meter thick. In view of the thin-bedded nature of this type of sequence, seismic reflections from this depositional setting are almost always an interference response from several acoustic-impedance boundaries. The reflections will follow the attitude of the bedding planes. Since bedding planes in this type of environmental typically parallel time lines, the seismic reflections will not be precise time lines, but will certainly parallel them. If the clastic unit is followed by fine-grained deposits, an onlap relationship may be inferred. In fine-grained deposits , bedding planes are generally subparallel and exteremely laterally extensive compared to bed thickness. Deposition is almost entirely from suspension load, and bedding planes and lithological change result from lithification, variations in sediment accumulation rate, etc. In these cases bedding planes, approximate to, or parallel, time lines. Gaps, even if geologically significant, will also tend to parallel time lines. From the relationship of thickness to lithology we can also conclude that time lines will be more closely spaced in fine grained sequences than in sand-sized grain deposits. There are lessons here for the ways in which we correlate wells. The dependence of the depositional process on varying current velocites dictates that sands must be accumulated episodically. 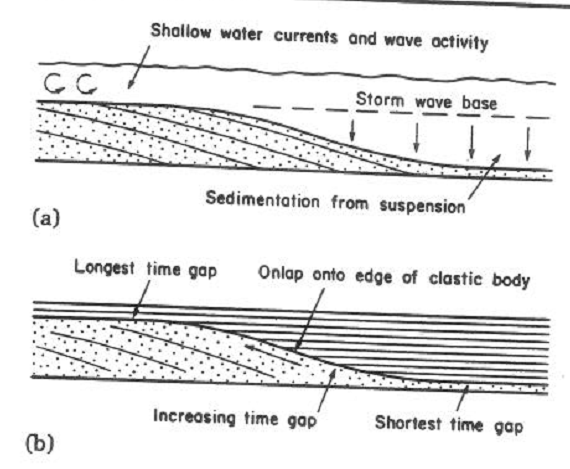 The time gap between successive depositional episodes will depend on the process causing the current velocity ( tides, storms, earthquakes, etc). Whatever the process, it is clear that sands cannot be deposited in the continual manner that is theoretically possible for clay-sized grains. Clays-sized grains, on the other hand, do have the potential to be deposited continually from suspension load in areas of the basin where current activity is low, although only modest currents may be required to retain nall clay-sized grains in suspension. An example of lateral relationships between sands and clays in a deep-water setting. Well A drilled a sandy sequence, Well B a clay sequence of similiar thickness and overall age. It is impossible for sands and clays of similiar thickness to be equivalent in age. There must be gaps in the sand sequence. Onlap relationships can be used to locate the gaps and assess their magnitude. Fundamental shape relationships between deposits of sand-sized and clay-sized grains. (a) A current transporting sand-sized grains flows into a deep water body from the left and slows down. A tapering bed is deposited. 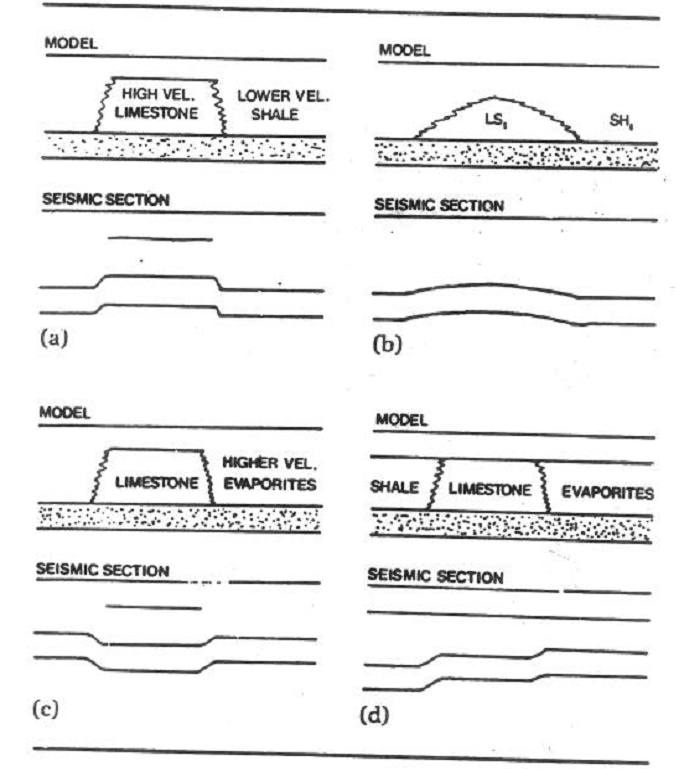 Sketches showing how the shape of a clastic body can influence subsequent sedimentation. Amplitude is the height of a seismic reflection peak (or trough) and is dependent on the reflection coefficient, but this direct relationship may be lost during processing. Frequently, amplitudes on seismic sections are balanced during processing to produce what is thought to be more easiliy interpretable sections. Usually, however, this makes it difficult and in many instances no longor possible to determine the relative strenghts of reflection coefficients. However, where amplitudes can be differentiated, the quantifying terms of high, medium, and low are used. Vertical changes in amplitude can be used to locate unconformities, whereas lateral changes can be used to help distinguish seismic facies. Great cautions must be exercised, however, as itnerference patterns from tuning, multiples, etc. , are responsible for many amplitude changes observed in seismic sections. Channels often produces a velocity anomaly. If the channel cuts down into consolidated material, there is a good chance that the channel fill will have lower velocity than the adjacent rock. Such a channel would cause a velocity push-down. Channels or canyons in the sea bed have the same effect. In some channels, however, the channel fill can have a higher velocity than the surrounding sediments and produce a velocity pull-up. (a) A reef composed of high-velocity limestone encased in lower-velocity shales produces a velocity pull-up on underlying reflections. (b) Same as (a), except the reef has a more rounded form. (c)A reef encased in an evaporitic sequence with high interval velocity push-down on underlying reflections. (d) A reef with low-velocity basinal shales to its left and high-velocity backreef evaporites to its right produces a push-down beneath the shales and pull-up beneath the evaporites.